They have nothing in common, most likely, except that my weekend will involve both of those lovely things. 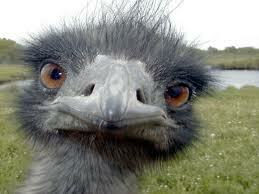 I'm emu-sitting for my new boss (yes, you heard me right! ), as well as caring for several other darling creatures over the next several days, as my two students and their parents will be away. Paul and I will also moving into our own place this weekend, and that is certainly very exciting to us, after living in the homes of friends and family while we have sorted through all our housing options. I'm eating up the Pottery Barn decorating books I got for a steal of a deal, a while back, and just can't wait to make this apartment feel like home. I've been working things out in my heart, too, so hopefully I will be as beautiful as those curtains I'm envisioning in the living room. Specifically, I'm learning how to better care for this temple I've been entrusted with, my body, the temple of the Holy Spirit, and learning to care for the dear husband God has entrusted to me. Both are a delightful challenge and joy. And they seem inter-connected. If I do not care for myself, I have nothing to offer my husband, and if I care only for myself, well, that is a dead-end street too. I am finding, again, that my diet on the Word is just as important as my diet on fresh fruits, veggies, and protein of all kinds. And can I say--I am so excited about my young wives' Bible study on the book of Philippians? These ladies are such a joy, and we are all so excited to learn more about Christ, the fountain of all true joy. While we have so much to be thankful for, Paul and I continue to think through many life issues, and we covet your prayers. May God bless you as you seek to follow and love Him fully.